SUVs are rapidly becoming the vehicle of choice among adventure seekers, urban drivers and outdoor enthusiasts alike. The combination of a heavy vehicle and tough terrain or rough city streets places great demand on the tyres to ensure safe and carefree driving in all conditions. To meet this demand, Nokian Tyres introduced Aramid Sidewall Technology, which utilises the extra strong aramid fibre in the tyre’s sidewalls, making them nearly indestructible. The technology safeguards all of Nokian Tyres’ premium SUV tyres, and this year the use is expanded to the tyres for light trucks, vans and campervans too. “Thanks to the Aramid Sidewall Technology Nokian Tyres’ SUV and van summer tyres have maximum strength, advanced safety and extreme durability. The aramid fibre that we use in the compound strengthens the tyre’s sidewall, allowing it to better withstand impacts and cuts from stones, potholes or raised curbs, which would otherwise easily puncture the tyre. The same material is also utilised by the aerospace and defence industries,” says Martin Dražík, Product Manager CE for Nokian Tyres. The Nokian Line SUV for versatile SUV use offers dynamic handling, pleasant driving comfort and excellent wet grip for small and medium-sized SUVs. The tyre is extremely hardwearing and maintains its high performance features kilometre after kilometre. In addition, it offers low fuel consumption, and extreme durability thanks to the unique Aramid Sidewall Technology. The sporty Nokian zLine SUV summer tyre combines precision handling, pleasurable driving and great wet grip to ensure safety on rain-soaked roads and under extreme conditions. The sidewalls are reinforced by Aramid Sidewall Technology, providing durability even for the largest SUVs. Developed for true off-road and 4x4 SUVs enthusiasts, the unique Nokian Rockproof tyre handles even the most demanding and extreme conditions with ease. The long service life and extreme durability in the roughest of terrains are provided not only by the Aramid Sidewall Technology, but also by the tyre’s special tread compound and robust tread design with unique stone ejector technology. Van and camper van tyres are also often in hard use during the summer time. Vehicles are heavily loaded and usually driven on poor roads, on gravel and over curbs. The tyres must bear the entire weight of the vehicle and provide safe and stable handling under all conditions. That´s why the Aramid Sidewall Technology can now be found in all Nokian Tyres’ van and camper van products on the market including Nokian cLine Van, Nokian cLine Cargo and Nokian Weatherproof C.
Passenger car drivers are spoilt for choice by Nokian Tyres’ highly functional premium summer tyre range. It includes such classics as the master of wet roads Nokian Line as well as its high-speed version Nokian zLine. The Nokian iLine tyre was especially developed for Central European conditions mainly for smaller family vehicles with an emphasis on fuel savings and excellent aquaplaning protection. The drivers of electric and hybrid vehicles especially will appreciate the highly economical Nokian eLine 2 tyre with an AA rating in rolling resistance. Nokian Tyres’ summer products have been successful in this spring’s summer tyres tests. Nokian zLine in size 235/45 ZR18 achieved the great 2nd (shared) place overall with the rating “Recommendable” in the German ACE Lenkrad Summer Tyre Test 2018. The test praised the tyre’s wet braking and handling and good aquaplaning characteristics. Also the dry handling and low rolling resistance were noted. The success continued in Germany’s GTÜ or Austria’s ARBÖ. Nokian SUV tyres are characterized by their durability and ability to provide protection in all situations, but sometimes life is unexpected. The Nokian Tyres Aramid Guarantee covers damages to the sidewall of the tyre arising from normal use. Customers can receive a new, equivalent tyre free of charge from any participating Nokian Tyres retailer. Nokian Tyres also provides a satisfaction promise. If a buyer, for whatever reason, is not satisfied with their new Nokian Tyres tyres, they can exchange them within 14 days for another set. 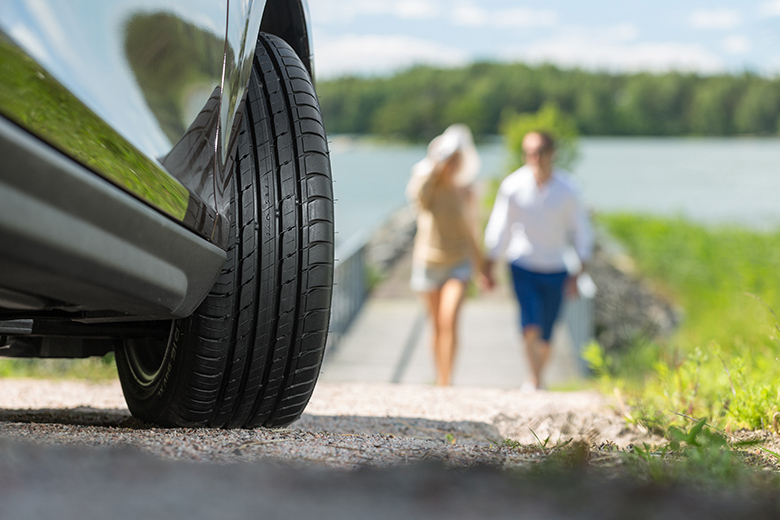 The Nokian Tyres satisfaction promise is available from selected dealers.